The catastrophe of the annihilation of more than one million people in the Armenian genocide as the first such act of systematic killing in the 20th century is a lesson for all humanity, Pope Francis has said. 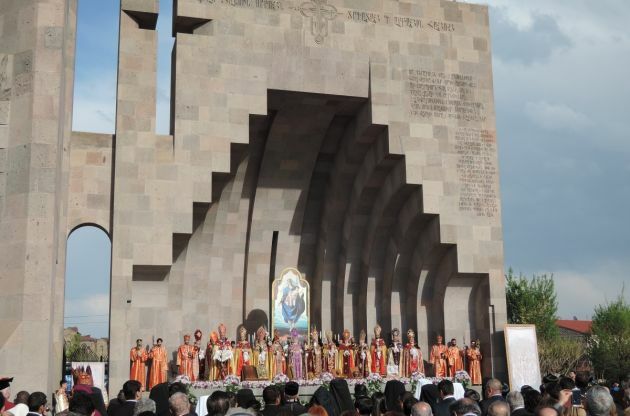 The Pope spoke on the genocide on the first day of his visit to Armenia after arriving at Yerevan's Presidential Palace June 24 speaking before President Serzh Sargsyan and other political and civil leaders. He recalled the president attending St. Peter's Basilica last year along with Catholicos Karekin II, head of the Armenian Apostolic Church in a visit seen as part of the Catholic Church's deepening gestures to deepen ties with Orthodox churches, Catholic News Agency reports. "The occasion was the commemoration of the centenary of the Metz Yeghérn, the 'Great Evil' that struck your people and caused the death of a vast multitude of persons," Francis said on his three-day trip. "Sadly, that tragedy, that genocide, was the first of the deplorable series of catastrophes of the past century, made possible by twisted racial, ideological or religious aims that darkened the minds of the tormentors even to the point of planning the annihilation of entire peoples." Francis said, "Having seen the pernicious effects to which hatred, prejudice and the untrammeled desire for dominion led in the last century, I express my lively hope that humanity will learn from those tragic experiences the need to act with responsibility and wisdom to avoid the danger of a return to such horrors." The mass killings of 1915-1916 have been deemed a genocide by most scholars and a number of nations when the Ottoman Empire systematically exterminated its minority Armenian population, who were predominantly Christian. About 1.5 million Armenians - men, women and children - lost their lives in ways ranging from meticulous torture to executions alongside mass graves. Turkey concedes that many Armenians died in clashes, but repudiates that the death of 1.5 million people was an act of genocide. Turkey says that the number of deaths was much smaller and came as a result of conflict surrounding the Frist World War. After Pope Francis' comments last year, Turkish leaders recalled their ambassador to the Holy See. Turkish deputy prime minister Nurettin Canikli on June 25 called Francis' comments "greatly unfortunate" and said they bore the hallmarks of the "mentality of the Crusades." He called the comments "greatly unfortunate" and said they bore the hallmarks of the "mentality of the Crusades." Armenia prides itself on being the first nation to have adopted Christianity as a State religion, which it did in the year 301. About 93 percent of its population belong to the Armenian Apostolic Church, an Oriental Orthodox Church. Sargsyan acknowledged this history in his welcoming remarks, telling the Pope, "Welcome to the first Christian nation." In his remarks, Pope Francis said, "I pay homage to the Armenian people who, illuminated by the light of the Gospel, even at the most tragic moments of their history, have always found in the Cross and Resurrection of Christ the strength to rise again and take up their journey anew with dignity." Reflecting on the state of the world, he said some present-day Christians may suffer persecution "even more than the first martyrs." "At the same time, all too many conflicts in various parts of the world remain unresolved, causing grief, destruction and forced migrations of entire peoples," he added. The Pope encouraged an end to conflict, the fostering of peacemaking, and the creation of a "culture of trust" that would help achieve lasting agreements. He pledged the Catholic Church's cooperation with those who prize the future of civilization, the rights of the human person, and the prevalence of spiritual values. Those who "befoul their meaning and beauty" will be exposed, he said. "In this regard, it is vitally important that all those who declare their faith in God join forces to isolate those who use religion to promote war, oppression and violent persecution, exploiting and manipulating the holy name of God." Referring to the 25th anniversary of Armenia's independence from the Soviet Union, Francis said Armenia has "suffered greatly" but has shown itself "capable of constantly being reborn." "The history of your country runs parallel to its Christian identity preserved over the centuries," he noted. "That identity, far from impeding a healthy secularity of the state, instead requires and nourishes it, favoring the full participation of all in the life of society, freedom of religion and respect for minorities." He said the Armenian people have known persecution and have preserved not only the memory of past harms, but also "the spirit that has enabled them always to start over again."